Sofie #5161 - Yankee Golden Retriever Rescue, Inc.
Sofie was seized by an animal control officer because she was living on a chain that was less than 2 feet long. Although there was a bucket of green, scummy water nearby, Sofie was not able to even reach it. The owners did not attempt to get Sofie back after she was seized, so the officer began looking for a home for this sweet girl. She was estimated to be about 4 years old. 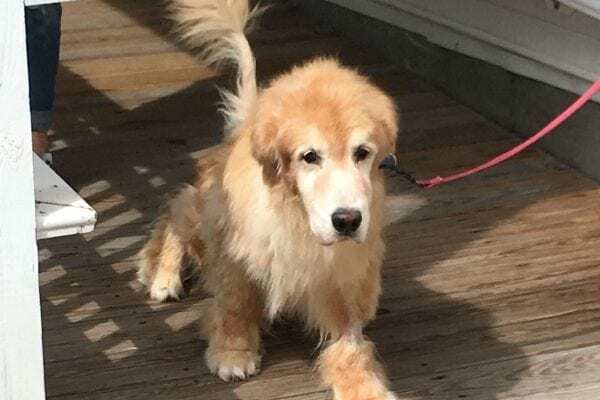 The ACO knew of an owner who had recently lost her beloved Golden girl. It seemed like a perfect match, so Sofie was soon on her way to her new home. This adopter intended to give Sofie the type of life she had never had before. Unfortunately, once Sofie arrived it was soon clear that she and the 2 resident female dogs were not compatible. Sofie’s adopter and the ACO decided that YGRR would be able to match Sofie to the exact type of home that was right for her, so she was admitted to YGRR. When she arrived at our vet hospital, Sofie was spayed. She had subsisted on table scraps thrown to her and had probably never eaten dog food or any type of balanced diet. Her teeth were in terrible shape and our vet thoroughly cleaned them and had to pull one. She also had a lump removed and sent for biopsy. We learned that her lump was a common type of skin cancer called mast cell. Luckily, this is usually a locally recurring type of cancer and once it is removed many dogs never have it come back. Sofie came back to Riverview to settle in and recover from her medical procedures. She was understandably nervous at first, but she soon was comfortable with the routine here and began to enjoy herself. She absolutely loved to be loved, and would snuggle against people to get attention. Outside in the play yards, she enjoyed the freedom to run that she had never known in her original life. While she enjoyed tennis balls, she would often just run in large circles as fast as her legs could carry her! This sweet girl was soon ready to move on to the type of home that every dog deserves. A wonderful adopter was invited to meet Sofie. It was love at first sight and Sofie was soon in the car on the ride to her new home. She took her favorite toy from Riverview with her, and although it is now headless, she still carries it to bed with her each night. She also has plenty of new toys, but that doesn’t stop her from collecting shoes and bringing them to her bed, too. Although she enjoys her very own comfortable dog bed, she is just as likely to be found on the couch. Whatever she feels like is fine with her adopter! Sofie still enjoys racing at top speed around her yard, as well as rolling in the grass. Sofie’s adopter is determined to make up for Sofie’s terrible first years and loves showing her what it is like to be a true part of a family. As for Sofie, she is now always smiling, and her biggest problem in her new life is the evil bunny who seemingly hangs around her yard just to taunt her! Sofie thanks you for your support. Your donations helped this wonderful girl get the type of care she had never known her entire life. Sofie now has a lifestyle any dog would envy. We would not be here for dogs like Sofie if you were not here for us. 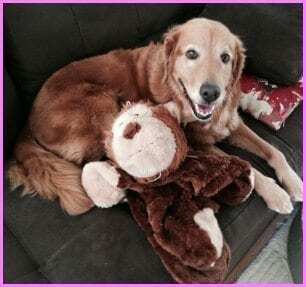 Sofie and all the Rescue Goldens send big wags and kisses your way!